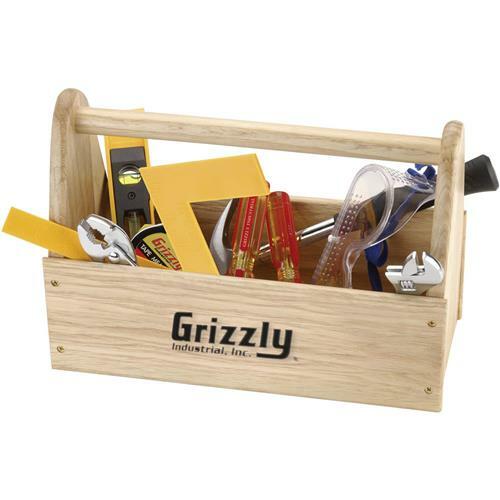 An 11 piece tool set that's great for the little helper in your wood shop! Transport & stow-away tools inside the solid wood caddy. Kit includes: safety glasses, wrench, level, hammer, pliers, Phillips® & slotted screwdriver, ruler, tape measure & square. Easy to use & carry. Great fun for kids ages 8 and up. Tool box measures 12-1/2" L x 6" W.
First project of course was to put together the wooden tool box included with the kit. Looking forward to building more projects with my grandson. My kids love having real tools to help dad with projects and they loved building their own toolbox. This is a wonderful starter tool set. I purchased this for my grandson for Christmas. Unfortunately the box does not assemble easily and it cracked. I believe you have to re-drill the screw holes. Hopefully they address this, but still a great set! The kit is a good value for the price. The tools are ok but the toolbox is not the best. The box was too difficult for my 11yo grandson to assemble. Not all boards were pre-drilled. That along with cupping caused both kits I bought to crack. 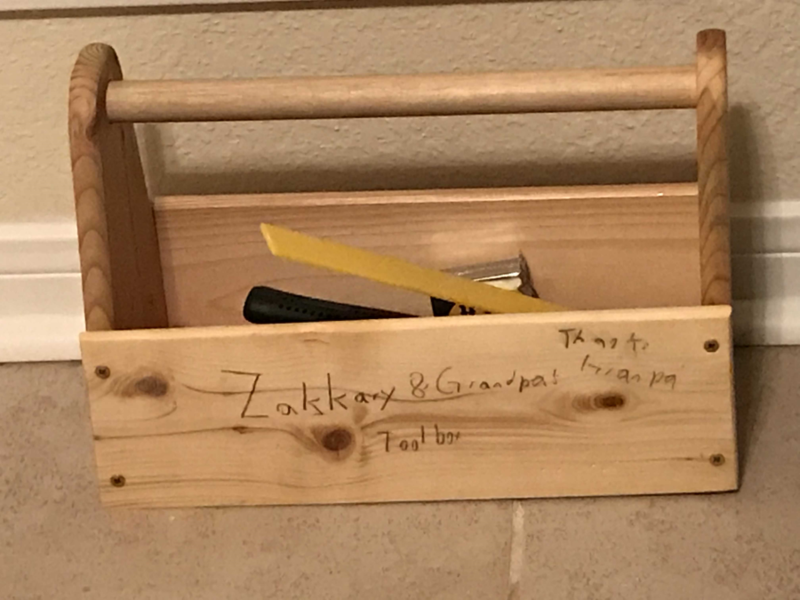 I will say my grandkids were thrilled with their tool boxes. 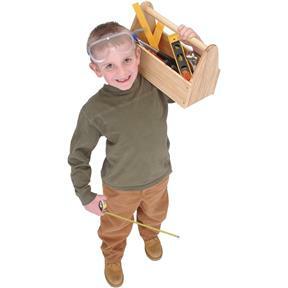 We bought this toolkit for our grandson, who has now become everyone's handyman. He loves it. The quality is first rate. Thanks for resending the Children's Tool Kit I ordered for my great nephew after UPS lost the original item. My 7 year old nephew loved the tool kit and did a great job of putting the box together! Your customer service was excellent every step of the way and were very responsive - which made me feel valued. It's rare to find a company like yours that cares about the products they carry and how their customers are treated - true customer service is alive and well at Grizzly Industrial! I would highly recommend this company to anyone. They have been extremely responsive every step of the way from the moment I contacted them and ordered the product online to when my nephew received the gift! Thank you! Purchased or my 8 yr old grandson's birthday. He loves it. We have purchased this product over the years for grandchildren...I have recommended it to other people because the children love it. and the other has built a workbench with it. thank you so much! I thought this would make a nice gift for my son and, while the tools are decent quality (especially for a toddler's use), the toolbox pieces are junk. The sides do not align well, the holes are not pre-drilled, and almost every piece of wood was warped or cupped. I spent more time re-making the box than I would expect to do for such a simple toolbox. This is an amazing little kit for kids between 4 and 9 in my opinion. It gives the basics of tools and safety in learning not only how to start woodworking, but great for coordination and starting to learn fractions. The box can be customizes with the name of the child and easy way to store the tools. I assisted my six year old in putting it together. It would be nice if the there were pilot hills in the end. I took of a star because it was hard to do that for him without making a pilot hole. Otherwise a nice package that he loves to use. It's a great little tool kit for younger kids. Bought this for my grandson for Xmas ... he loves it ... real tools for a boy who wants to learn how to " fix" things .would recommend this for a child 5 yrs and older ...not for a younger child . Product made extremely well .